To follow up with last week's post....its SCARY to put yourself out there, to take that risk and share your dream with no guarantee that support will follow. But I did it...its been a slow but steady start. With all of your help, we've already raised $41 dollars to help Nashville flood victims! Thanks to everyone who has supported this effort. As news of the flooding starts to fade from the headlines, please know that the clean up effort here is a continuous long term project, and anything we can give back is a huge help right now. So I feel that in taking that big scary leap last week, God really blessed me! I received an email last week from someone by the name of Ashley. She worked for Quilted Northern and had come across my post about wanting to upgrade my toilet paper. Only a few days later, I recieved a huge box of Quilted Northern toilet paper. And as if heavenly softness of 2-ply was not enough, they threw in a pack of 3-ply toilet paper. I didnt even know they made 3-ply! 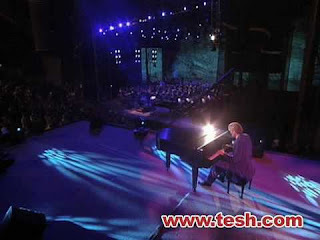 A few days later, I get an email stating that I have won a VIP concert package to meet John Tesh. For someone who never wins anything, this was an awesome surprise! John Tesh is not only an amazing musician and radio host, but has been one of the driving forces inspiring me to go after my dreams. If you know anything about this guy, he's all for spreading positivity, and sharing your dreams and talents to help other people. So, looks like pretty soon I'm gonna get a chance to tell him he has been a huge encouragement, and then enjoy an awesome concert, dinner, soundcheck and who knows what else. So then, just so God could be funny, I get another email from the John Tesh team saying I won another contest for free cereal bars, and an IPod Nano! Maybe some people would pass that off as just luck. But I fully believe this was one of God's creative ways to bless me for taking a risk, and trusting Him with my dreams! All these little blessings have been nice. They kept me going this week. I pray the cards have found a way to bless the lives of each of you who have received one or purchased one this week. As always, thanks for reading and stay blessed!